Tomorrow night (March 24, 2016) the Boston Bruins will hold a short ceremony to honour Claude Julien for passing Art Ross as the winningest coach in team history. Ross held the Bruins coaching record for nearly 92 years, from the time the team won its first game on November 1, 1924, until Julien equalled him with his 387th Boston victory on March 3, 2016 and surpassed him with win #388 two games later on March 7. Tracking coaching victories – especially in the early days – is not as easy as you may think. Historically, NHL game sheets have never listed the name of the man behind the bench, so the fact that old-time writers used the words coach and manager interchangeably (regardless of whether they meant what we’d think of today as the coach, assistant coach, or general manager) makes it difficult to know for certain who was ever really running the team. This was all made abundantly clear to me when Dan Diamond & Associates produced the first edition of Total Hockey in 1998 and among my many jobs (which is one I continue to do for the annual NHL Official Guide & Record Book) was to build and maintain the coaching database. 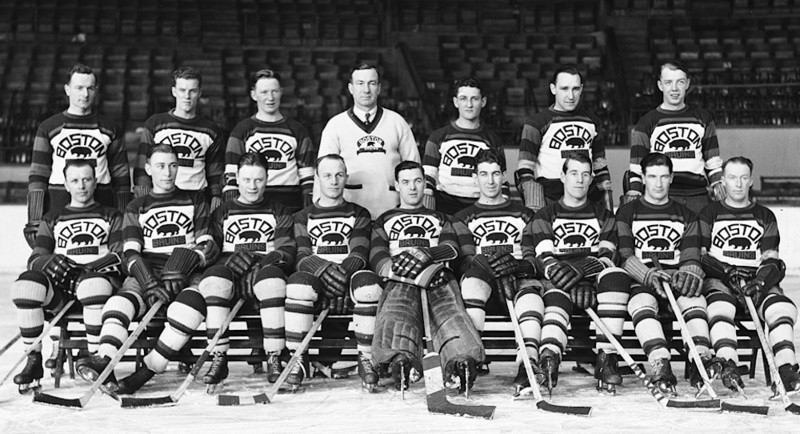 Art Ross with the 1930-31 Bruins. (Boston Public Library 05_02_010561). 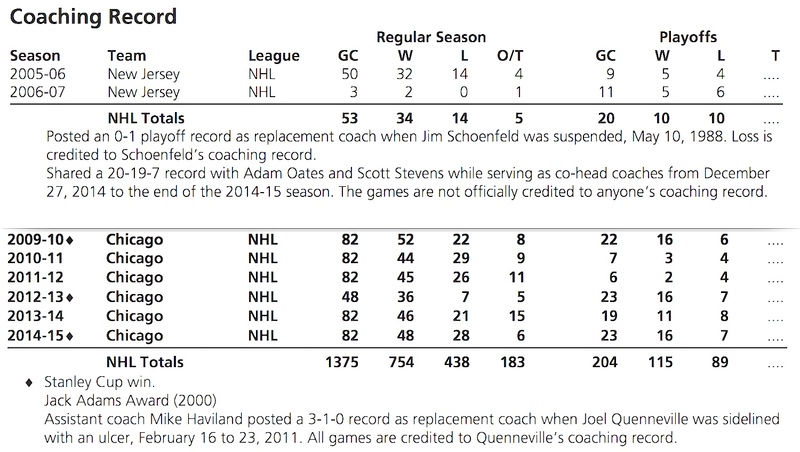 Segments of the coaching records for Lou Lamoriello (above) and Joel Quenneville. 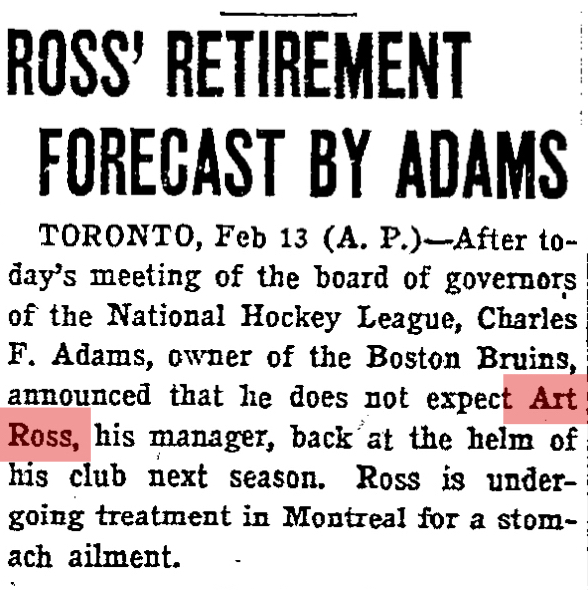 Over his years in Boston, there were many occasions when Art Ross was credited with a win, loss, or tie despite being absent from games. From late January to early March of 1928, Ross was sidelined by a stomach ailment so serious it was thought he might be forced to retire. Defenceman Sprague Cleghorn (who was also serving as an assistant coach that season) took over as coach for nine games and posted a record of 6-1-2. Ross would later miss games for health reasons in 1932-33 and 1933-34 and would also turn over coaching duties to Dit Clapper – sometimes for weeks at a time – while on scouting trips to scrounge players in his role as general manager during the years of World War II. Still, all those missing games are included in Ross’s overall Bruins record, which stands at 387-290-95 for his 17 seasons behind the bench during a time when schedules ranged from 30 to 50 games. Article from the Boston Globe, February 14, 1928. Even so, perhaps the quirkiest aspect of Art Ross’s coaching tenure in Boston is the fact that he just recently had an entire lost season returned to his record. The problem dates back to 1958 when the Stanley Cup was remodelled to standardize the size of the haphazard bands on the “barrel” of the trophy used since the late 1920s. Duplicate of the original Boston Bruins band from 1929. 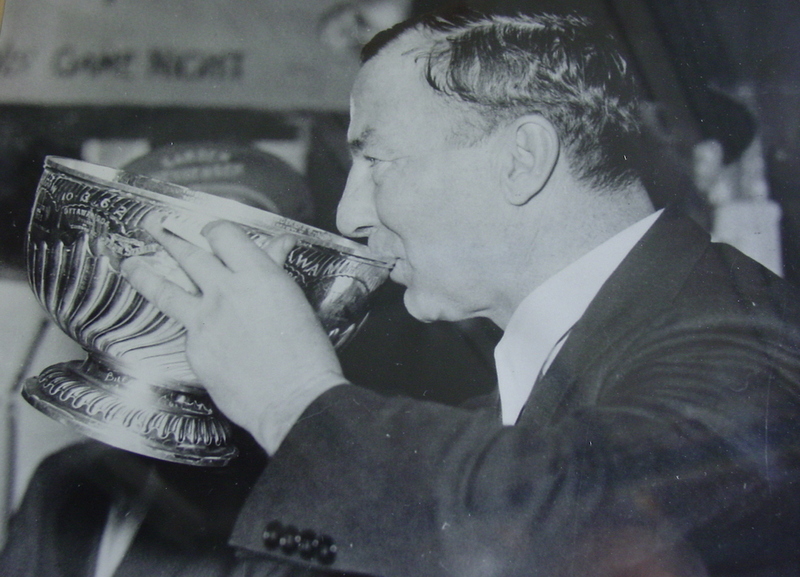 On the original band the Bruins engraved to commemorate their first Stanley Cup victory in 1929 (and which still appears on the the “neck” of the Cup today), Art Ross was noted as Vice President and Manager. No one is designated as the coach. When the 1929 Bruins were added to the first standard-sized band atop the barrel in 1958, Ross was designated Manager, but this time Cy Denneny’s name appeared twice; once with his fellow players and once as the team’s coach. 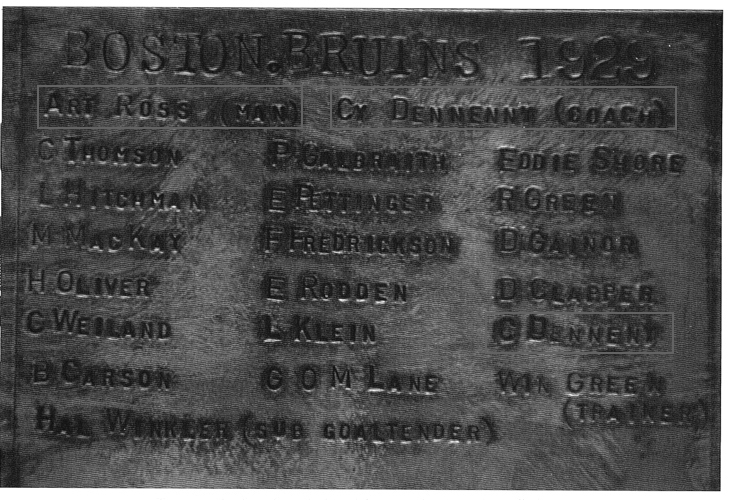 Some time afterwards, Ross’s coaching line for 1928-29 was deleted and Denneny was credited with the Bruins’ record of 26-13-5. The decision appears to have been based mainly on the Stanley Cup engraving. Boston’s 1929 victory displayed on the new band created in 1958. Elias had found no evidence that Denneny coached the Bruins in 1928-29, so Benny asked me to investigate. I pored over as many period newspapers as I could, and while some do note Denneny as coach (as they had for assistant coach Sprague Cleghorn the year before), the vast majority indicated that he’d been signed to play for the Bruins and to assist Art Ross in his duties as coach and manager. Bruins programs from the 1928-29 season clearly list Denneny as “left wing and assistant coach.” Newspapers in Boston and Ottawa (where Denneny had starred for years) are pretty clear too – and when Ross did turn over coaching duties to Frank Patrick in 1934, all stories about it state that Ross has been the coach in Boston since the team’s beginning in 1924.
and the Boston Globe,October 25 and 26, 1928. And so, beginning in 2013-14, Art Ross had the 1928-29 season returned to his coaching record, giving him the 387-win total that now ranks second in Bruins history behind Claude Julien. 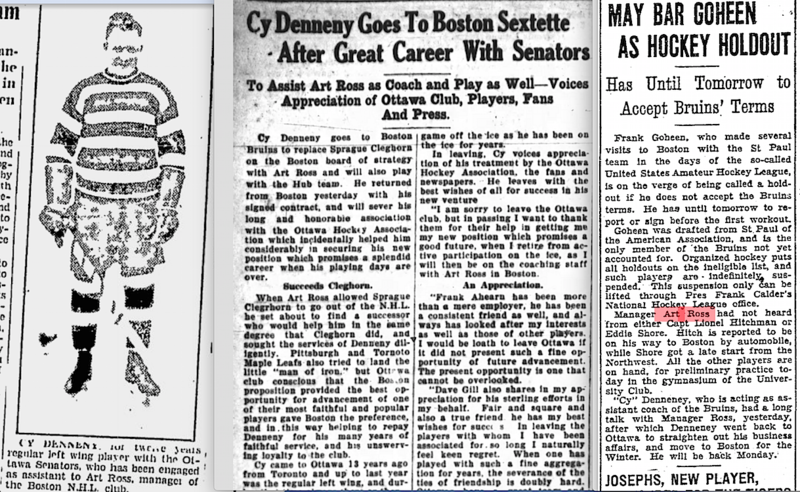 Write-up on Cy Denneny that appeared in Bruins programs during 1928-29. Wow, I did not know this particular story about your sleuthing. And you righted a wrong! Great detective work — really interesting story — thanks — and glad you’re feeling better. Nice work Eric…in research, the result and your usual writing acumen!